Note: This is Part 1 of a two-part series on the SixEstate blog dealing with digital legacy. Please check in next week for Part 2, which will involve more in-depth coverage for specific websites, such as WordPress, LinkedIn, Flickr, etc. Ever wondered what will happen to your digital existence after you die? Email, domain names, social networking content — do you want to leave it behind, ‘bequeath’ it, or delete it? These were some of the questions that framed a panel at the 2009 South by Southwest (SXSW) Interactive, entitled “Who Will Check My Email After I Die?,” which garnered positive reviews and led to a followup panel in 2010 and the upcoming SXSW in March. The panelists, Evan Carroll and John Romano, published a book this past November entitled Your Digital Afterlife: When Facebook, Flickr and Twitter Are Your Estate, What’s Your Legacy? that addresses these topics. The duo also run the website TheDigitalBeyond.com, which follows a similar theme. According to The New York Times, only about 1/3 of Americans have a will. Most people probably don’t even think about digital estate planning, but one of Romano and Carroll’s top tips include naming a digital executor. “It’s very possible that the person who’s handling your estate may not be the person who has the technical understanding to take care of your digital things,” Romano says. An appointed digital executor won’t necessarily have any legal authority to your estate, however, unless specifically named in your will. Creating an inventory of your online accounts, including URLs, usernames and passwords, would be helpful. Don’t put this information into your will, though, since it becomes public record. On the inventory list, specify what you would like to be done with each account. As you start to compile the list, you may realize just how many online accounts you own, and not just social media or blogging. What about bills you pay online and accounts for which you receive paperless statements? Keep in mind that giving access to some websites will grant access to other areas of your life, e.g., someone with your PayPal password could then use funds in your checking account. Some sites’ Terms of Service do not allow for transfers of accounts, so giving another person control over your account could cause it to be deleted whether that was in your action plan or not. “But at this point, providing that access is so much better than the risk of not providing that access at all and having that potentially go away altogether,” says Carroll. Estate law has only begun to consider the topic. Leading thinkers on technology and culture are understandably far more focused on exciting potential futures, not on the most grim of inevitabilities. […] Academics have begun to explore the subject (how does this change the way we remember and grieve? ), social-media consultants have begun to talk about it (what are the legal implications?) and entrepreneurs are trying to build whole new businesses around digital-afterlife management (is there a profit opportunity here?). Trendwatching.com has predicted a growth in “profile myning” and products or services that protect digital content. Services such as Dead Man’s Switch and Slightly Morbid will send out posthumous emails on your behalf, written by you before your demise. Clare Jacobson of Dealmaker Media compiled a list of some other digital afterlife services, including If I Die, Legacy Locker, and My Wonderful Life. Romano and Carroll have compiled an even more extensive list at The Digital Beyond. The duo will be doing a panel at the 2011 SXSW in March, called “You’re Dead, Your Data Isn’t: What Happens Now?“. You can check out the Digital Beyond website, or follow the authors on Twitter at @digital_beyond, or subscribe to their video channel on YouTube. One of their videos is embedded below. 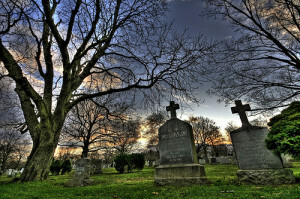 Image of graveyard by Andrew E. Larsen (papalars), used under its Creative Commons license. 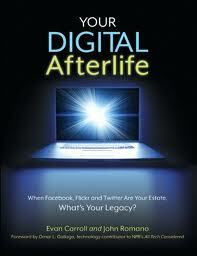 Image of Your Digital Afterlife book cover used under Fair Use: Reporting.